It had to come sooner or later: I hit my first plateau with the violin. You know, that point where you keep practicing and working and somehow nothing seems to improve (and sometimes things even get worse!). This is frustrating, but I recognize that it’s part of the process and you just have to push on. After a while, something will click, and you’ll start making progress again. My plateau hit while working on the first two Minuets in Suzuki book #1. These are two simple pieces in 3/4 time in the key of G. I’ve gotten rather good at scales and arpeggios in the key of G (when I relax and focus), but this only means I hear my mistakes all the more when playing the pieces. :) You know you’re at a plateau when you start getting exactly the same feedback and homework assignments from your teacher on subsequent weeks. For me, the struggle was in (as dumb as this sounds) using the whole bow. I’d gotten used to practicing with a small mid-section of the bow, as this made “enough” sound for me. So, just use the whole bow, right? But you have to cram the whole bow into a quarter note. Suddenly I was rushing, trying to use up the whole bow’s real estate in one click of the metronome. And my intonation degraded, and the bow would make breathy sounds or skip on the strings. Ugh! Gradually I figured out that some of this can be addressed by pressing more firmly (“dig in!” says my teacher) and that it’s really an issue of good bow control (not just letting it slide across the strings), which will come with practice and time. At about this point, I happened across the excellent “Teaching Suzuki” blog (by a Suzuki teacher) who coincidentally posted about Long Bow Day. She writes about the utility of setting aside a practice session just to work on long bows, and breaks this down very nicely. I went on to read some more of her posts, which manage somehow to be both delightful detailed and accessible, and fascinating in that they provide pedagogical insights about (her philosophy of) how one learns the violin. She appears to be working her way through book 1 right now, in her posts, so I’m eager for her to “catch up” to where I am with the evil Minuets. I love the chance to learn from someone else in addition to my weekly lessons. Anyway, after much effort, I am making more forte-like sounds, and the intonation is improving. I feel I’m starting to break free of that static-feeling plateau. I’m also getting a bit better at some associated skills from these pieces, like triples (3 notes played in one quarter-note’s time; tricky mainly because it’s a rhythm change), staccato slurs, and “hopping” a left-hand finger to enable playing two notes in succession that require the same finger but are on different strings. Onward and upward! It never occurred to me to wonder where Motorola got its name. Recently, I heard this fascinating tidbit and followed up — it appears to be true! In 1930 Galvin Manufacturing Corporation introduced the Motorola radio, one of the first commercially successful car radios. Company founder Paul V. Galvin created the brand name Motorola for the car radio — linking “motor” (for motorcar) with “ola” (which implied sound). Thus the Motorola brand meant sound in motion. I remember a long, boring lull between when I was admitted to USC and when the classes and action finally started up that fall. Not so with SJSU and their Library Science program! I am inundated with emails about colloquia, activities, student groups, meetups, blogs, and more on a daily basis. They certainly take their mission seriously, of making the virtual learning environment as immersive and connective as possible! The other neat thing I learned about is SLIS’s Center for Information Research and Innovation (CIRI). What sort of research do Library Science profs do, I wondered? Their current projects include studies of archive methods, the efficacy of text messages as a way to query the reference desk, developing an online library science program for Vietnam, YA (young adult) space practices, and virtual internships. They also have a CIRI research blog! I keep having to remind myself that, in this community, “research” often means “searching archives and information sources for the answer to a question” (i.e., what you do to get an answer for a patron) *not* “developing a new algorithm to solve a problem.” I may have cognitive dissonance on that one for a while. It’s the little things… like your website suddenly vanishing. My website (including this blog) is hosted by Dreamhost, a great company with great service. They offer a lot of one-click installs and generally make it easy to set up a blog or email accounts or mailing lists, etc. Recently they started offering a free CloudFlare plan to Dreamhost subscribers. CloudFlare offers two benefits: faster webpage loads (by distributing your content across different servers around the world) and community-based protection from spam, bots, crawlers, etc. I thought I’d try it out, so I signed up. When you check the “CloudFlare” box, Dreamhost warns that you need to allow them to redirect all traffic that comes in as http://mydomain.com/ to http://www.mydomain.com/. This seems harmless enough, and it worked fine for me at first, until I realized that one of my WordPress installations stopped working. Trying to visit http://www.wkiri.com/comphist/ or http://wkiri.com/comphist both resulted in an error: “Too many redirects.” Oddly, my other blog (http://www.wkiri.com/today/) did not have this problem. Keep reloading your WordPress site until it works (i.e., the DNS updates propagate). Log in to your WordPress site and go to the Dashboard. Click “Settings”. Update the “WordPress Address (URL)” and “Site Address (URL)” fields to have the form http://www.mydomain.com/something. Scroll down and click “Save Changes”. You may or may not also need to clear your browser’s cookies for this site. Go back to the Dreamhost panel, re-enable CloudFlare, and save settings. 16 of 16 people learned something from this entry. Last Sunday found me once again on stage to spell under the spotlight. 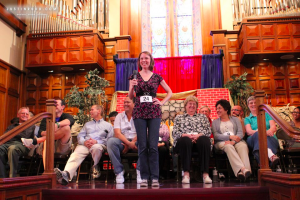 This was my third National Adult Spelling Bee, and I was surprised to discover that it felt more like a reunion than a competition. Many of the spellers greeted me by name, and I enjoyed seeing so many familiar faces. Vicky was there wearing a custom necklace with a Scrabble V tile for a pendant. Janice was back with her trademark air-spelling and joyful exuberance. I guess once you get started, it’s easy to get hooked! imbrue: a new one on me! It means “to soil or stain.” I guessed… correctly. pelagic: I knew my Master’s in Geology would come in handy someday (that’s where I learned this word). esemplastic: another new one, meaning “shaping or having the power to shape disparate things into a unified whole.” Again, I guessed… correctly. At this point we were down to five contestants. And then I was given “asceticism” to spell. I rolled the word around in my head for a moment to get it right, then started spelling. I was so focused on getting the “asc” part right that — alack! — I lost a syllable along the way. I spelled “a-s-c-e-t-i-s-m” and I was out, placing 4th (since two of the remaining spellers tied for third). The final two rounds were amusing. We were down to two spellers. Michael Petrina, who comes all the way from Virginia (almost) every year for this event, was given “dossier” to spell, which he did. Patricia Knatz was then given “limen,” which means “a threshold of a physiological or psychological response.” She misspelled it, and then Michael was given “flageolet” (!! it’s “a woodwind musical instrument”). He laughed and said that he’d gotten that word at a previous bee and missed it! So, happily, he got it right this time, and walked away with first place (he also won in 2009. He’s a really great speller!). I don’t know about other spelling bees, but I was really struck here by how friendly everyone was. One doesn’t applaud after each correctly spelled word, but instead on those moments when someone is spelled out. This applause was always very genuine, and often handshakes were extended between contestants. It’s a slightly weird feeling, sitting in a group where all the spelling antennae are so sensitized that you can feel the collective indrawn breath when a word is misspelled, and the collective nod of satisfaction when a word is spelled correctly. And yet it was also a feeling of being with “your” people—people who *feel* the rightness or wrongness of orthography. The focus was so intense that I started feeling simultaneously sort of floaty but also very, very present. Everything was crowded out but the words. You can’t help but spell along in your head for everyone else’s words. That’s two solid hours of words and letters and words. Whew! I’m certain I’ll be back next year, ready to pit myself against the dictionary once more. I love it that spelling bees aren’t just for kids!